"Saint Paul" and "Saint-Paul" redirect here. For other uses, see Saint Paul (disambiguation). Paul of Tarsus, also called Saint Paul, Paul the Apostle, or the Apostle Paul, (Ancient Greek: Σαούλ (Saul), Σαῦλος (Saulos), and Παῦλος (Paulos); Latin: Paulus or Paullus; Hebrew: שאול התרסי‎ Šaʾul HaTarsi (Saul of Tarsus) (c.5 BC - c.67 AD), was a Jew who called himself the "Apostle to the Gentiles". According to the Acts of the Apostles, his conversion to Christianity took place in a profound life-changing experience on the road to Damascus. Together with Simon Peter and James the Just, he is among the most notable of early Christian missionaries. Thirteen epistles in the New Testament are attributed to Paul, though authorship of six of the thirteen is questioned by some scholars. According to the Oxford Dictionary of the Christian Church, Paul's influence on Christian thinking arguably has been more significant than any other New Testament author. Paul's belief in Jesus as the Christ dramatically changed the course of his life. Through his activity and writings, his beliefs eventually changed religious thought throughout the Mediterranean. This leadership, influence and legacy led to the formation of communities dominated by gentile groups that adhered to the Judaic "moral code" but relaxed or abandoned the "ritual" obligations of the Mosaic law on the basis of the life and works of Jesus Christ. These communities eventually formed Christianity, see also Biblical law in Christianity. The Book of Acts contains an account of Paul's travels and deeds, his conflicts with pagans and Jews, and his interactions with the other apostles. It was written from a perspective of reconciliation between Pauline Christians and their opponents, and portrays Paul as a law-abiding Jewish Christian and omits his dispute with Peter. A primary source for historical information about Paul's life is the material found in his seven letters. However, these letters contain comparatively little information about Paul's past. It is worth noting that Acts leaves several parts of Paul's life out of its narrative, such as his execution in Rome. Scholars such as Hans Conzelmann and 20th century theologian John Knox (not the 16th century John Knox) dispute the historical reliability of the Acts of the Apostles. Paul's own account of his background is found particularly in Galatians. According to some scholars, the account in Acts of Paul visiting Jerusalem[Acts 11:27-30] contradicts the account in Paul's letters. (Please see the full discussion in the Acts of the Apostles article). Some scholars consider Paul's accounts more reliable than those found in Acts. According to his own testimony, Paul “violently persecuted” the “church of God” (followers of Jesus) prior to his conversion to Christianity. and was advancing in stature within Judaism's Jerusalem temple leadership before he came to believe that the crucified Jesus, of the line of David, was actually Lord. [Rom. 1:3] Paul's writings give some insight into his thinking regarding his former place in Judaism. He is strongly critical both theologically and empirically of claims of moral or lineal superiority [2:16-26] of Jews while conversely strongly sustaining the notion of a special place for the Children of Israel. [9-11] His aggressive and authoritative writing style, even when addressing the supposed "super-apostles", [1 Cor. 11] some of whom certainly had more persuasive claims to apostleship, having known Jesus during his lifetime, suggests that Paul's stature in Judaism and the temple leadership must have been quite high. Paul persistently relied on the persecutions he endured as his claim to proximity to Jesus. 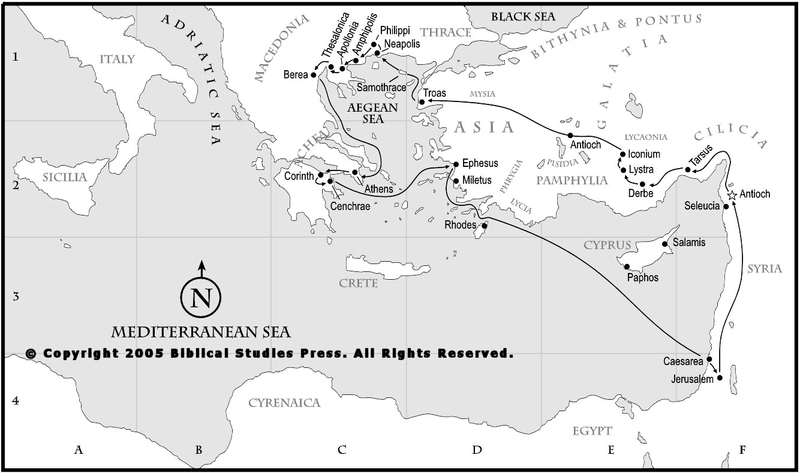 Geography relevant to Paul's life, stretching from Jerusalem to Rome. Paul's conversion can be dated to AD 33 - AD 36 by his reference to it in one of his letters. According to the Acts of the Apostles, his conversion (or metanoia) took place on the road to Damascus where he experienced a vision of the resurrected Jesus after which he was temporarily blinded. [Acts 9:1-31] [22:1-22] [26:9-24] This event is the source of the phrase Pauline conversion. There is no explicit written record that Paul had known Jesus personally prior to the Crucifixion. Paul asserted that he received the Gospel not from any person, but by the revelation of Jesus Christ.[Gal. 1:11–12] Paul claimed almost total independence from the "mother church" in Jerusalem. The writer of the Acts arranges Paul's travels into three separate journeys. 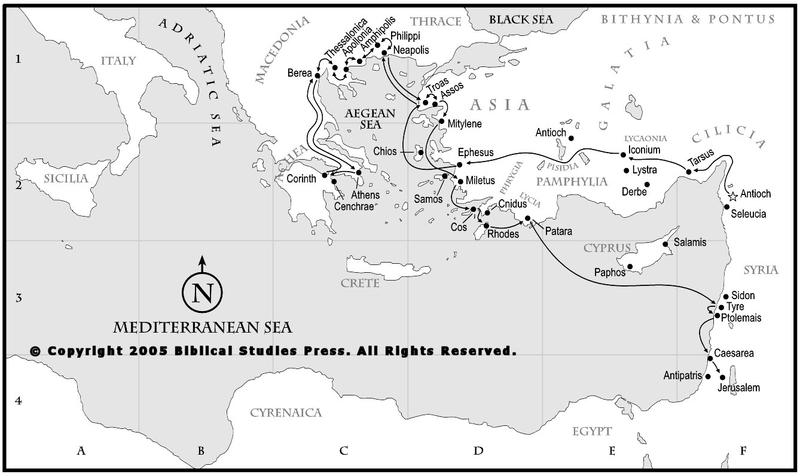 The first journey,[Ac 13-14] led initially by Barnabas, takes Paul from Antioch to Cyprus then southern Asia Minor (Anatolia), and back to Antioch. On Cyprus, Paul rebukes Elymas the magician[Ac 13:8-12] who was criticizing their teachings. From this point on, Paul is described as the leader of the group. 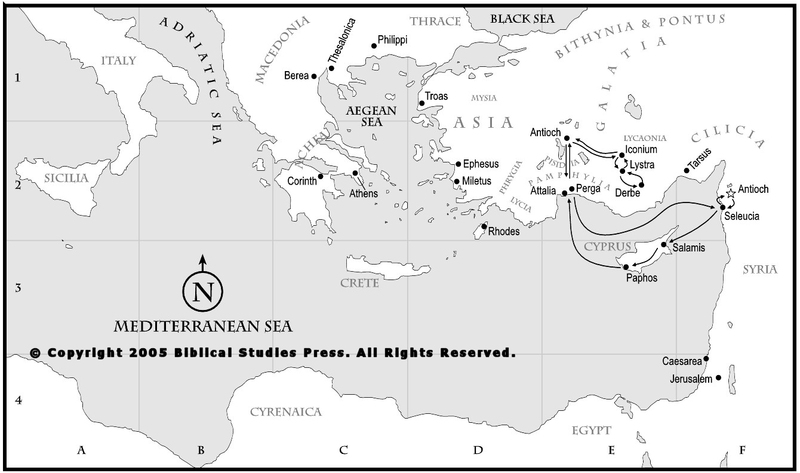 Antioch served as a major Christian center for Paul's evangelizing. Most scholars agree that a vital meeting between Paul and the Jerusalem church took place in AD 49 or 50, described in Acts 15:2 and usually seen as the same event mentioned by Paul in Galatians 2:1. The key question raised was whether Gentile converts needed to be circumcised. At this meeting, Peter, James, and John accepted Paul's mission to the Gentiles. See also Circumcision controversy in early Christianity. Jerusalem meetings are mentioned in Acts, in Paul's letters, and some appear in both. For example, the Jerusalem visit for famine relief[Acts 11:27–30] apparently corresponds to the "first visit" (to Cephas and James only).[Gal. 1:18–20] F. F. Bruce suggested that the "fourteen years" could be from Paul's conversion rather than the first visit to Jerusalem. Despite the agreement achieved at the Council of Jerusalem as understood by Paul, Paul recounts how he later publicly confronted Peter, also called the "Incident at Antioch" over Peter's reluctance to share a meal with Gentile Christians in Antioch. Writing later of the incident, Paul recounts: "I opposed [Peter] to his face, because he was clearly in the wrong". Paul reports that he told Peter: "You are a Jew, yet you live like a Gentile and not like a Jew. How is it, then, that you force Gentiles to follow Jewish customs?"[Gal. 2:11–14] Paul also mentions that even Barnabas (his traveling companion and fellow apostle until that time) sided with Peter. The final outcome of the incident remains uncertain. The Catholic Encyclopedia states: "St. Paul's account of the incident leaves no doubt that St. Peter saw the justice of the rebuke." In contrast, L. Michael White's From Jesus to Christianity claims: "The blowup with Peter was a total failure of political bravado, and Paul soon left Antioch as persona non grata, never again to return." The primary source for the Incident at Antioch is Paul's letter to the Galatians. Around AD 50-52, Paul spent 18 months in Corinth. The reference in Acts to proconsul Gallio helps ascertain this date. Here he worked with Silas and Timothy. After Corinth, the next major center for Paul's activities was Ephesus. Ephesus was an important center for early Christianity from the AD 50s, see also Early centers of Christianity#Western Anatolia. From AD 52 to AD 54, Paul lived here, working with the congregation and apparently organizing missionary activity into the hinterlands. Paul's time here was marked by disturbances and possibly imprisonment. Finally, he was forced to leave. Next, he traveled to Macedonia before going probably to Corinth for three months (AD 56-57) before his final visit to Jerusalem. Though Paul wrote that he visited Illyricum, he meant Illyria Graeca that was part of the Roman province of Macedonia. Paul arrived in Jerusalem AD 57 with a collection of money for the congregation there. Acts reports that the church welcomed Paul gladly, but it was apparently a proposal of James that led to his arrest. Paul caused a stir when he appeared at the Temple, and he escaped being killed by the crowd by being taken into custody. He was held as a prisoner for two years in Caesarea until a new governor reopened his case in AD 59. When accused of treason, he appealed to Caesar, claiming his right as a citizen of Rome to appear there before a proper court and to defend himself of the charges. Acts reports that he was shipwrecked on an island which some scholars have identified as Malta [Acts 28:1] where he was met by Publius[Acts 28:7] and the islanders, who showed him "unusual kindness". [Acts 28:2] He arrived in Rome c AD 60 and spent two years under house arrest. [Acts 28:16] All told, during his ministry the Apostle Paul spent roughly 5 1/2 to 6 years as a prisoner or in prison. Irenaeus of Lyons in the 2nd century believed that Peter and Paul had been the founders of the Church in Rome and had appointed Linus as succeeding bishop. Though not considered a bishop of Rome, Paul is considered highly responsible for bringing Christianity to Rome. Neither the Bible nor other history says how or when Paul died. According to Christian tradition, Paul was beheaded in Rome during the reign of Nero around the mid-60s AD at Tre Fontane Abbey (English: Three Fountains Abbey). By comparison, tradition has Peter being crucified upside-down. Paul's Roman citizenship accorded him the more merciful death by beheading. In June 2009, Pope Benedict XVI announced excavation results concerning the tomb of Saint Paul at the Basilica of Saint Paul Outside the Walls. The sarcophagus itself was not opened but was examined by means of a probe. It revealed pieces of incense and purple and blue linen as well as small bone fragments. The bone was radiocarbon dated to the 1st to 2nd century. According to the Vatican, this seems to confirm the tradition of the tomb being Saint Paul's. Thirteen epistles in the New Testament are traditionally attributed to Paul, of which seven are almost universally accepted, three are considered in some academic circles as other than Pauline for textual and grammatical reasons, and the other three are in dispute in those same circles. Paul apparently dictated all his epistles through a secretary (or amanuensis), who would usually paraphrase the gist of his message, as was the practice among first-century scribes. These epistles were circulated within the Christian community, where they were read aloud by members of the church along with other works. Paul's epistles were accepted early as scripture and later established as Canon of Scripture. Critical scholars regard Paul's epistles (written 50-62) to be the earliest-written books of the New Testament. They are referenced as early as c. 96 by Clement of Rome. Saint Paul Writing His Epistles, 16th century (Blaffer Foundation Collection, Houston, Texas). Paul's letters are largely written to churches which he had visited; he was a great traveler, visiting Cyprus, Asia Minor (modern Turkey), mainland Greece, Crete, and Rome. His letters are full of expositions of what Christians should believe and how they should live. He does not tell his correspondents (or the modern reader) much about the life of Jesus; his most explicit references are to the Last Supper[1 Cor. 11:17-34] and the crucifixion and resurrection. [1 Cor. 15] His specific references to Jesus' teaching are likewise sparse,[1 Cor. 7:10-11] [9:14] raising the question, still disputed, as to how consistent his account of the faith is with that of the four canonical Gospels, Acts, and the Epistle of James. The view that Paul's Christ is very different from the historical Jesus has been expounded by Adolf Harnack among many others. Nevertheless, he provides the first written account of what it is to be a Christian and thus of Christian spirituality. Of the thirteen letters traditionally attributed to Paul and included in the Western New Testament canon, there is little or no dispute that Paul actually wrote at least seven, those being Romans, First Corinthians, Second Corinthians, Galatians, Philippians, First Thessalonians, and Philemon. Hebrews, which was ascribed to him in antiquity, was questioned even then, never having an ancient attribution, and in modern times is considered by most experts as not by Paul (see also Antilegomena). The authorship of the remaining six Pauline epistles is disputed to varying degrees. The authenticity of Colossians has been questioned on the grounds that it contains an otherwise unparalleled description (among his writings) of Jesus as 'the image of the invisible God,' a Christology found elsewhere only in John's gospel. On the other hand, the personal notes in the letter connect it to Philemon, unquestionably the work of Paul. Ephesians is a very similar letter to Colossians, but is almost entirely lacking in personal reminiscences. Its style is unique. It lacks the emphasis on the cross to be found in other Pauline writings, reference to the Second Coming is missing, and Christian marriage is exalted in a way which contrasts with the reference in 1 Cor. 7:8-9. Finally, according to R.E. Brown, it exalts the Church in a way suggestive of a second generation of Christians, 'built upon the foundation of the apostles and prophets' now past. The defenders of its Pauline authorship argue that it was intended to be read by a number of different churches and that it marks the final stage of the development of Paul of Tarsus's thinking. Russian Orthodox icon of the Apostle Paul, 18th century (Iconostasis of Transfiguration Church, Kizhi Monastery, Karelia, Russia). The Pastoral Epistles, 1 and 2 Timothy, and Titus have likewise been put in question as Pauline works. Three main reasons are advanced: first, their difference in vocabulary, style and theology from Paul's acknowledged writings; secondly, the difficulty in fitting them into Paul's biography as we have it. They, like Colossians and Ephesians, were written from prison but suppose Paul's release and travel thereafter. Finally, the concerns expressed are very much the practical ones as to how a church should function. They are more about maintenance than about mission. 2 Thessalonians, like Colossians, is questioned on stylistic grounds, with some noting, among other peculiarities, a dependence on 1 Thessalonians yet a distinctiveness in language from the Pauline corpus. For its theology of atonement, the Christian church owes a unique debt to the writings of Paul. Paul taught that Christians are redeemed from the Law (see Supersessionism) and from sin by Jesus' death and resurrection. His death was an expiation; as well as a propitiation, and by Christ's blood, peace is made between God and man. By baptism, a Christian shares in Jesus' death and in his victory over death, gaining, as a free gift, a new, justified status of sonship. Some scholars see Paul (or Saul) as completely in line with first-century Judaism (a "Pharisee"), others see him as opposed to first-century Judaism (see Antinomianism in the New Testament and Marcionism), while still others see him as somewhere in between these two extremes, opposed to "Ritual Laws" (see for example Circumcision controversy in early Christianity) but in full agreement on "Divine Law". These views of Paul are paralleled by the views of Biblical law in Christianity. See also Expounding of the Law versus Antithesis of the Law. Paul's theology of the gospel accelerated the separation of the messianic sect of Christians from Judaism, a development contrary to Paul's own intent. He wrote that the faith of Christ was alone decisive in salvation for Jews and Gentiles alike, making the schism between the followers of Christ and mainstream Jews inevitable and permanent. He successfully argued that Gentile converts did not need to become Jews, get circumcised, follow Jewish dietary restrictions, or otherwise observe Mosaic Law. Nevertheless, in Romans he insisted on the positive value of the Law, as a moral guide. E. P. Sanders' publications have since been taken up by Professor James Dunn who coined the phrase "The New Perspective on Paul" and N.T. Wright, the Anglican Bishop of Durham. Wright, noting a difference between Romans and Galatians, the latter being much more positive about the continuing covenant between God and his ancient people than the former, contends that works are not insignificant but rather proof of attaining the redemption of Jesus Christ by grace (free gift received by faith)[Rom. 2:13ff] and that Paul distinguishes between works which are signs of ethnic identity and those which are a sign of obedience to Christ. Paul believed that Jesus would return within his lifetime. He expected that Christians who had died in the mean time would be resurrected to share in God's kingdom, and he believed that the saved would be transformed, assuming supernatural bodies. Paul's teaching about the end of the world is expressed most clearly in his letters to the Christians at Thessalonica. Heavily persecuted, it appears that they had written asking him first about those who had died already, and, secondly, when they should expect the end. Paul regarded the age as passing and, in such difficult times, he therefore encouraged marriage as a means of happiness. He assures them that the dead will rise first and be followed by those left alive. [1 Thes. 4:16ff] This suggests an imminence of the end but he is unspecific about times and seasons, and encourages his hearers to expect a delay. The form of the end will be a battle between Jesus and the man of lawlessness[2 Thess. 2:3] whose conclusion is the triumph of Christ. A verse in Paul's letter to Timothy[1 Tim 2:12 KJV] is often used as the main biblical authority for prohibiting women from becoming ordained clergy and or holding certain other positions of ministry and leadership in Christianity, though Paul's authorship of this letter is debated. The Letter to Timothy is also often used by many churches to deny women a vote in church affairs, reject women from serving as teachers of adult Bible classes, prevent them from serving as missionaries, and generally disenfranchise women from the duties and privileges of church leadership. The apparent message of this verse is certainly strange and seemingly anachronistic to 21st century mentality with its emphasis on egalitarianism and non-discrimination. When the KJV translation of this passage is understood literally, the passage seems to be saying that women are second-class citizens at every level. However, any interpretation of this portion of Scripture must wrestle with the theological, contextual, syntactical, and lexical difficulties embedded within these few words. Fuller Seminary theologian J. R. Daniel Kirk finds evidence in Paul’s letters of a much more inclusive view of women. He writes that Romans 16 is a tremendously important witness to the important role of women in the early church. Paul praises Phoebe for her work as a deacon and Junia who was an apostle. Kirk points to recent studies that have led "many scholars" to conclude that the passage in 1 Corinthians 14 excluding women’s participation in worship was a later addition, apparently by a different author, and not part of Paul’s original letter to Corinth. His third example is Galatians 3:28, “in Christ Jesus there is no longer Jew and Greek, slave and free, male and female.” In pronouncing an end within the church to the divisions which are common in the world around it. He concludes by highlighting the fact that "despite what 1 Timothy commands, there were New Testament women who taught and had authority in the early churches, that this teaching and authority was sanctioned by Paul, and that Paul himself offers a theological paradigm within which overcoming the subjugation of women is an anticipated outcome." The conversion on the way to Damascus, by Caravaggio. Paul's influence on Christian thinking arguably has been more significant than any other New Testament author. Paul declared that faith in Christ made the Torah unnecessary for salvation, exalted the Christian church as the body of Christ, and depicted the world outside the Church as under judgment. Paul's writings include the earliest reference to the supper of the Lord, a rite traditionally identified as the Christian Eucharist, as instituted by Christ at the Last Supper. Some postulate that the Last Supper was actually a Jewish Passover meal, known as a seder. In the East, church fathers reduced the element of election in Romans 9 to divine foreknowledge. The themes of predestination found in Western Christianity do not appear in Eastern theology. In the Reformation, Martin Luther expressed Paul's doctrine of faith most strongly as justification by faith alone. John Calvin developed Augustine's predestination into double predestination. In his commentary The Epistle to the Romans (Ger. Der Römerbrief; particularly in the thoroughly re-written second edition of 1922) Karl Barth argued that the God who is revealed in the cross of Jesus challenges and overthrows any attempt to ally God with human cultures, achievements, or possessions. Many theologians believe this work to be the most important theological treatise since Friedrich Schleiermacher's On Religion: Speeches to its Cultured Despisers. The image of Saint Paul in a parish dedicated to him in the Roman Catholic Diocese of Cubao. "By reason of jealousy and strife Paul by his example pointed out the prize of patient endurance. After that he had been seven times in bonds, had been driven into exile, had been stoned, had preached in the East and in the West, he won the noble renown which was the reward of his faith, having taught righteousness unto the whole world and having reached the farthest bounds of the West; and when he had borne his testimony before the rulers, so he departed from the world and went unto the holy place, having been found a notable pattern of patient endurance." Commenting on this passage, Raymond Brown writes that while it "does not explicitly say" that Paul was martyred in Rome, "such a martyrdom is the most reasonable interpretation." Eusebius of Caesarea, who wrote in the fourth century, states that Paul was beheaded in the reign of the Roman Emperor Nero. This event has been dated either to the year 64, when Rome was devastated by a fire, or a few years later, to 67. The San Paolo alle Tre Fontane church was built on the location where the execution was believed to have taken place. A Roman Catholic liturgical solemnity of Peter and Paul, celebrated on June 29, may reflect the day of his martyrdom, other sources have articulated the tradition that Peter and Paul died on the same day (and possibly the same year). A number of other sources including Clement of Rome, say that Paul survived Rome and went to "the limits of the west." Some hold the view that he could have revisited Greece and Asia Minor after his trip to Spain, and might then have been arrested in Troas, and taken to Rome and executed. [2 Tim. 4:13] A tradition holds that Paul was interred with Saint Peter ad Catacumbas by the via Appia until moved to what is now the Basilica of Saint Paul Outside the Walls in Rome. Bede, in his Ecclesiastical History, writes that Pope Vitalian in 665 gave Paul's relics (including a cross made from his prison chains) from the crypts of Lucina to King Oswy of Northumbria, northern Britain. However, Bede's use of the word "relic" was not limited to corporal remains. Paul, who was quite possibly martyred in Rome, has long been associated with that city and its church. Paul is the patron saint of London. Elaine Pagels, professor of religion at Princeton and an authority on Gnosticism, argues that Paul was a Gnostic  and that the anti-Gnostic Pastoral Epistles were "pseudo-Pauline" forgeries written to rebut this. British Jewish scholar Hyam Maccoby contends that the Paul as described in the Book of Acts and the view of Paul gleaned from his own writings are very different people. Some difficulties have been noted in the account of his life. Paul as described in the Book of Acts is much more interested in factual history, less in theology; ideas such as justification by faith are absent as are references to the Spirit, according to Maccoby. He also points out that there are no references to John the Baptist in the Pauline Epistles, although Paul mentions him several times in the Book of Acts. Others have objected that the language of the speeches is too Lukan in style to reflect anyone else's words. Moreover, some have argued that the speeches of Peter and Paul are too much alike, and that especially Paul's are too distinct from his letters to reflect a true Pauline source. Despite these suspicions, historian-attorney Christopher Price concludes that Luke's style in Acts is representative of those ancient historians known for accurately recording speeches in their works. Examination of several of the major speeches in Acts reveals that while the author smoothed out the Greek in some cases, he clearly relied on preexisting material to reconstruct his speeches. He did not believe himself at liberty to invent material, but attempted to accurately record the reality of the speeches in Acts. Maccoby theorizes that Paul synthesized Judaism, Gnosticism, and mysticism to create Christianity as a cosmic savior religion. According to Maccoby, Paul's Pharisaism was his own invention, though actually he was probably associated with the Sadducees. Maccoby attributes the origins of Christian anti-Semitism to Paul and claims that Paul's view of women, though inconsistent, reflects his Gnosticism in its misogynist aspects. Professor Robert Eisenman of California State University, Long Beach argues that Paul was a member of the family of Herod the Great. Professor Eisenman makes a connection between Paul and an individual identified by Josephus as "Saulus," a "kinsman of Agrippa." Another oft-cited element of the case for Paul as a member of Herod's family is found in Romans 16:11 where Paul writes, "Greet Herodion, my kinsman." This is a minority view in the academic community. Among the critics of Paul the Apostle was Thomas Jefferson who wrote that Paul was the "first corrupter of the doctrines of Jesus." Howard Brenton's 2005 play Paul takes a skeptical view of his conversion. F.F. Powell argues that Paul made use of many of the ideas of the Greek philosopher Plato in his epistles, sometimes even using the same metaphors and language. For example, in Phaedrus, Socrates says that the heavenly ideals are perceived as though "through a glass dimly." These words are echoed by Paul in 1 Corinthians 13:12. ^ Encyclopedia Britannica, Saint Paul the Apostle, 2008, O.Ed. ^ Walton, Steve (2000). Leadership and Lifestyle: The Portrait of Paul in the Miletus Speech and 1 Thessalonians. Cambridge University Press. pp. 3. ISBN 0521780063. http://books.google.com/books?id=P9NznB__-E0C&pg=PA3&vq=%22these+scholars+see+the+paul%22&dq=conzelmann+paul+acts&as_brr=3&sig=QanFBxTbjopfPhsPqcWm1PG3lLw. ^ Bromiley, Geoffrey William (1979). International Standard Bible Encyclopedia: A-D (International Standard Bible Encyclopedia (Wbeerdmans)). Wm. B. Eerdmans Publishing Company. pp. 689. ISBN 0-8028-3781-6. ^ Barnett, Paul (2002). Jesus the Rise of Early Christianity: A History of New Testament Times. InterVarsity Press. pp. 21. ISBN 0-8308-2699-8. ^ L. Niswonger, Richard (1993). New Testament History. Zondervan Publishing Company. pp. 200. ISBN 0-310-31201-9. ^ a b c White, L. Michael (2004). From Jesus to Christianity. HarperCollins. pp. 148–149. ISBN 0060526556. http://books.google.com/books?id=w4ehxXoIxCUC&pg=PA149&vq=%22Two+more+of+Paul%27s+visits+to+Jerusalem%22&dq=paul+%22visits+to+jerusalem%22+acts+letters&as_brr=3&sig=Lir18QcyIN5vGQhjG0W8m8KwIqI. ^ Catholic Encyclopedia: Judaizers see section titled: "The Incident At Antioch"
^ Catholic Encyclopedia: Judaizers: "On their arrival Peter, who up to this had eaten with the Gentiles, "withdrew and separated himself, fearing them who were of the circumcision," and by his example drew with him not only the other Jews, but even Barnabas, Paul's fellow-labourer." ^ White, L. Michael (2004). From Jesus to Christianity. HarperSanFrancisco. pp. 170. ISBN 0060526556. http://books.google.com/books?id=w4ehxXoIxCUC&pg=PA170&vq=%22total+failure+of+political+bravado%22&dq=paul+%22visits+to+jerusalem%22+acts+letters&as_brr=3&sig=EZ2xNofTh3Rw11WHiHXs-iVqhR8. ^ Paul does not exactly say that this was his second visit. In Galatians, he lists three important meetings with Peter, and this was the second on his list. The third meeting took place in Antioch. He does not explicitly claim that he did not visit Jerusalem in between this and his first visit. ^ Ireneaus Against Heresies 3.3.2: the "...Church founded and organized at Rome by the two most glorious apostles, Peter and Paul; as also [by pointing out] the faith preached to men, which comes down to our time by means of the successions of the bishops. ...The blessed apostles, then, having founded and built up the Church, committed into the hands of Linus the office of the episcopate." ^ Joseph Barber Lightfoot in his Commentary on the Epistle to the Galatians writes: "At this point[Gal. 6:11] the apostle takes the pen from his amanuensis, and the concluding paragraph is written with his own hand. From the time when letters began to be forged in his name([2 Thes. 2:2]; 2 Thes. 3:17 it seems to have been his practice to close with a few words in his own handwriting, as a precaution against such forgeries... In the present case he writes a whole paragraph, summing up the main lessons of the epistle in terse, eager, disjointed sentences. He writes it, too, in large, bold characters (Gr. pelikois grammasin), that his handwriting may reflect the energy and determination of his soul." ^ Brown, R.E., The Churches the Apostles left behind p.48. ^ Barrett, C.K. the Pastoral Epistles p.4ff. ^ The First Epistle of Clement to the Corinthians, 5:5–6, translated by J.B. Lightfoot in Lightfoot, Joseph Barber (1890). The Apostolic Fathers: A Revised Text with Introductions, Notes, Dissertations, and Translations. Macmillan. pp. 274. OCLC 54248207. http://earlychristianwritings.com/text/1clement-lightfoot.html. ^ Brown, Raymond Edward; John Paul Meier (1983). Antioch and Rome: New Testament Cradles of Catholic Christianity. Mahwah, NJ: Paulist Press. pp. 124. ISBN 0809125323. http://books.google.com/books?id=_6H3XKLXGvYC&pg=PA124&vq=%22such+a+martyrdom+is+the+most+reasonable+interpretation%22&dq=paul+clement+death&as_brr=3&sig=CcsRPhc3hLHN-RKGuHtE1mVQsyk. ^ Ellis, Ralph Ralph Ellis Homage . ^ The Writings of Thomas Jefferson: Being his Autobiography, Correspondence, Reports, Messages, Addresses, and Other Writings, Official and Private. Published by the Order of the Joint Committee of Congress on the Library, from the Original Manuscripts, Deposited in the Department of State, With Explanatory Nites, Tables of Contents, and a Copious Index to Each Volume, as well as a General Index to the Whole, by the Editor H. A. Washington. Vol. VII. Published by Taylor Maury, Washington, D.C., 1854. ^ Powell, F. F.Saint Paul's Homage to Plato, worldandi.com retrieved on Nov. 16, 2008. Brown, Raymond E. An Introduction to the New Testament. Anchor Bible Series, 1997. ISBN 0–385–24767–2. Maccoby, Hyam. The Mythmaker: Paul and the Invention of Christianity. New York: Harper & Row, 1986. ISBN 0–06–015582–5. Paul of Tarsus (c. 10 - c. 67) originally named Saul, was one of the most notable of early Christian missionaries, his prolific writings forming a major portion of the New Testament. His influence on Christian thinking has, arguably, been more significant than any other New Testament author, though he himself never knew Jesus in life, but was converted to his faith by a vision which appeared to him in his efforts to suppress Christianity. We conclude that a man is justified by faith without the deeds of the law. Is Paul the Father of Misogyny and Antisemitism? - IS PAUL THE FATHER OF MISOGYNY AND ANTISEMITISM? Catholic Resources - Catholic Resources - Felix Just, S.J. Romans 16:13 - Romans 16:13 Greet Rufus, chosen in the Lord, and his mother, who has been a mother to me, too.